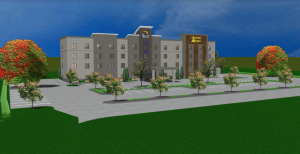 Putnam County, WV… The Harding Hospitality, Inc is proud to announce they are starting construction on a new prototype that joins 2 Choice Hotel brands under 1 roof. This concept is one of the fastest growing concepts in the industry. Choice Hotels has sold over 140 franchises since the dual property design was introduced in 2017. Owners, Kelsey & Angela Harding are officially announcing the new hotel, Sleep Inn & MainStay Suites at a Press Conference on October 18, 2018 at 10:00 a.m. at the Putnam County Chamber of Commerce located at 971 WV-34, Hurricane, WV 25526. “We’re excited to expand our family business into Putnam County, where we have lived for the last 20 years. We believe that the new dual brand concept hotel will be a great addition to the Teays Valley community. The Sleep Inn & MainStay Suites-Teays Valley will offer guests accommodations suitable for leisure, business, extended stay travel and everything in between,” stated Angela Harding. The Sleep Inn style rooms offer the amenities that short-term guests need while the MainStay Suites caters to extended stay guests. The Sleep Inn & MainStay Suites of Teays Valley will have the only extended stay rooms from Charleston to Huntington, WV. More details announced at the Press Conference. Kelsey and Angela Harding developed the Sleep Inn in Charleston and the Sleep Inn in Cross Lanes. Both hotels have consistently ranked in the top 10 of all Sleep Inns in the country. The Cross Lanes location has been named the Sleep Inn of the Year six times. The Harding’s also own and operate Harding’s Family Restaurant at exit 1, I-79. For further information call 304-541-4756.